The electronics industry sees money in your health. This story is from Kaiser Health News. If the scores of personal health care devices at the Consumer Electronics Show last week are any indication, it’s clear that the Apple Watch has kicked off a rush by high-tech companies to capitalize on people’s worries about their health. The latest version of the watch, which was announced last fall, detects a fibrillating heart and a propensity for falls. What other manufacturers learned from that is that you can make money if you can create a worry about a problem that people didn’t realize they had and also create a solution for that worry via a high-tech product. Many of the products at the mammoth annual show seemed to be following that strategy. In a rush to brush? Take, for instance, the problem of the length of time it takes to brush your teeth. With Y-Brush, you can cut down that onerous two-minute recommended time to 10 seconds, and supposedly still get your teeth cleaner. Makers of the Y-shaped device say it brushes all your top and then bottom teeth in five seconds each, giving each tooth four times the brush exposure it would get with a typical two-minute tooth-by-tooth brushing regimen recommended for users of a conventional electric toothbrush. The company says its device removes 15 percent more plaque than a traditional toothbrush. And, of course, you’ve freed up an additional 110 seconds in your life each time you brush. The $125 Y-Brush handle and brush will be sold online this year; additional brush heads, which need to be replaced every six months, will cost $25. (Eric Taub for KHN) The D Free monitors changes in bladder size and transmits that information to a smartphone app, which sends a customizable alert to the person when it's time to find a toilet. Another problem: You can’t always predict when you need to go to the bathroom. DFree, a sensor worn a half-inch above the pubis bone, predicts when an individual will have to urinate, giving the wearer a chance to gauge how long they can be away from a toilet. 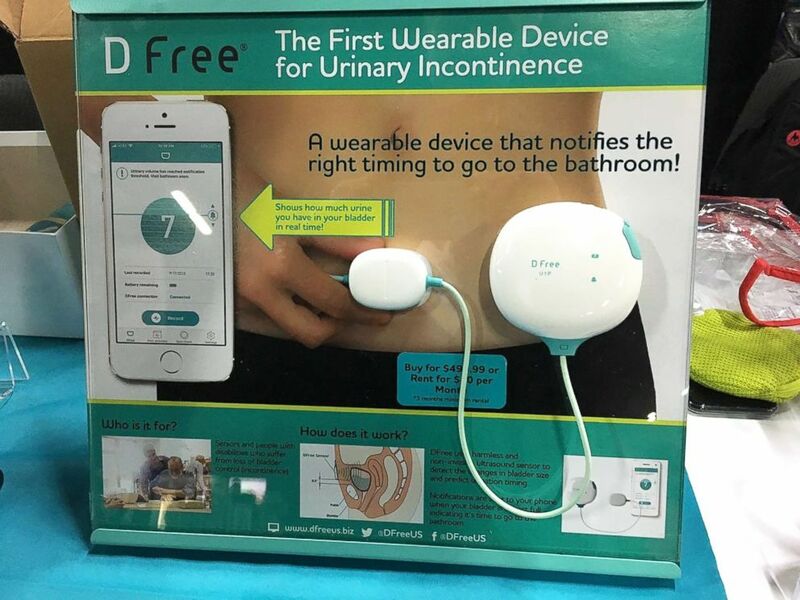 The DFree monitors changes in bladder size and transmits that information to a smartphone app, which sends a customizable alert to the person when it’s time to find a toilet. The company says it doesn’t work for pregnant women or toilet-training toddlers. The unit costs $500, or it can be rented for $40 per month, with the rental price applied to an eventual purchase. Detecting falls, now a feature of the Apple Watch, is showing up in other devices. Like in this belt, which also can alert you to weight gain as it senses the belt getting tighter. (Yeah, like old-fashioned belts do.) The Welt smart belt, developed with seed money from Samsung, also monitors the time you spend sitting and the number of steps taken. Connected to a smartphone app (naturally), Welt suggests when a user should stand or change their eating habits and will also send a customized alert after a fall. There was no shortage at the show of devices to improve your mental abilities. BrainTap, an app-based subscription series of audio music and vocal stimulations, provides visualization exercises that the company says will retrain your brain to allow you to relax, reduce stress and maximize your ability to lose weight. The company charges $10 to $30 a month for the series, based on whether you need to address only one or more conditions. The electronics industry seems to believe it can make money convincing people they should be worried about their hearts. A number of products that take a simplified form of an electrocardiogram (EKG) are already on the market, the Apple Watch and Kardia among them. The WitCard, from WitMonki, is a credit card-size device that, by touching two thumbs and one index finger, sends results to one’s health care provider where, using the company’s WitDisplayer portal, EKG readings over time can be compared and appropriate action taken when necessary. The battery-operated WitCard is undergoing trials for European Union certification and approval by the Food and Drug Administration, and could cost about $120. Ever worry about whether you are burning carbs or fats? Well, now there’s a way. Breathe into the Lumen device each morning to get a reading of your carbon dioxide concentration. Based on that, a phone app determines how yesterday’s sleep, exercise and eating choices affected your ability to burn carbs or fats. Lumen also promises to tell you if you have sufficient energy stores before exercising (and what to do about it), why you feel tired all the time and how to alter your diet to lose weight. The company expects to ship its $249 device this August. Philips, the giant electronics company, has become the latest company to soothe our worries about not getting enough sleep. Its SmartSleep, a $400 headband worn in bed, emits audible tones that supposedly detect and boost slow-wave, or deep, sleep — a time when breathing and heart rate are at their slowest. The intent of SmartSleep is to keep the wearer in the deep-sleep zone longer; it does not increase the amount of time one sleeps or help someone fall or stay asleep. And, if you are older, you are out of luck, as the device is recommended for people between 18 and 50. Philips says the slow-wave activity declines as we age and becomes more difficult to detect. Finally, an obvious problem: how to remember to take multiple drugs multiple times per day. And, of course, there is a just-as-obvious solution: automated drug-dispensing devices. One of the latest products to attempt this is RxPense, which offers high-tech bells and whistles. The machine is loaded with hermetically sealed pill blister cards by a participating pharmacy. Once the card’s bar code confirms it’s the proper one and loaded into the machine, the patient is identified by facial recognition, an RFID bracelet or a PIN, and the proper pill pack, confirmed by the bar code on the packaging, is dispensed at the set time. But wait, there is more. A camera records the dispensed pills and the patient’s removal of them. Missed doses are not dispensed. The RxPense can be leased for $150 a month. The device can’t tell whether the patient has actually ingested the pill. For that, pills will need to include a digestible RFID tag to track its trip through the body. The FDA approved Abilify MyCite, the first drug with a built-in tracking sensor, in 2017. Don’t be surprised to see a device at next year’s show that can tell you where those tagged pills are.